Why settle for a nasty cluttered garage when you can enjoy driving into a neat, organized space which can be the envy of your buddies – whether you live on the Muirfield Golf Course in Dublin or in the ‘burbs of Westerville. Innovate Home Org can help you design and install a wall-to-wall custom garage cabinets and storage system for your Columbus home where there will truly be a place (and zone) for everything. In this page Innovate Home Org (an authorized Dealer of Org Home) will provide you with the benefits, features, and answer your questions about custom garage cabinets and storage solutions while offering an effective design for your Columbus home. This is a nice feature before you enter your home. A boot bench provides a place to take off your shoes and to store them. The OrgWall unit provides slots for hooks, baskets and a place for your kids to put their book bags or favorite team jerseys – no matter who you root for a team in Westerville, Dublin or Galena. The 1” thick platinum finished cabinets provide a luxury look – but are made to withstand the rigors of the garage setting. What a nice idea to be able to step out of the house and to have a reach in slotted recycling center. Taking care of the environment has never been this organized. This 24" deep extra tall cabinet has a distinguished Driftwood finish with a white interior – easy to clean and stylish. Euro style hinges are a sturdy feature of this door. Extruded aluminum handles will protect the edges of your garage cabinetry. This cabinet is an extra deep 24" which works well for large tote storage. Equipped with a fully integrated back will protect your garage walls from items being moved into and out of the cabinets. The thermally fused laminate covering (shown here in a "Heritage Maple" color) is built to protect against objects rubbing against the cabinets. The 1" thick shelves are fully adjustable. Who said a garage couldn't be for work and fun. This workbench has a secret display shelf for your favorite adult beverages. This could be a fun game to watch Ohio State football on a Saturday. The "Chateau" finish provides a sophisticated look to this garage storage system. A "Silver track" accessory system behind the hidden shelf offers an elegant look with plenty of space to hang your screwdrivers, wrenches and other hand tools. Imagine your home in Upper Arlington, Westerville or Dublin with a high performance garage which looks this neat. 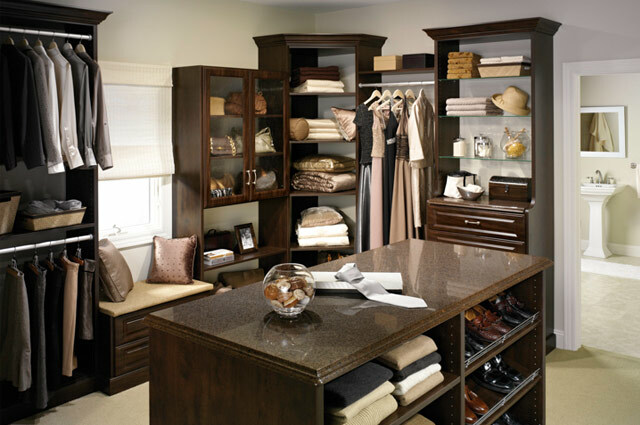 With custom wall-to-wall cabinetry it's completely possible. Cabinets and drawers can keep all your sporting and yard tools out of view. 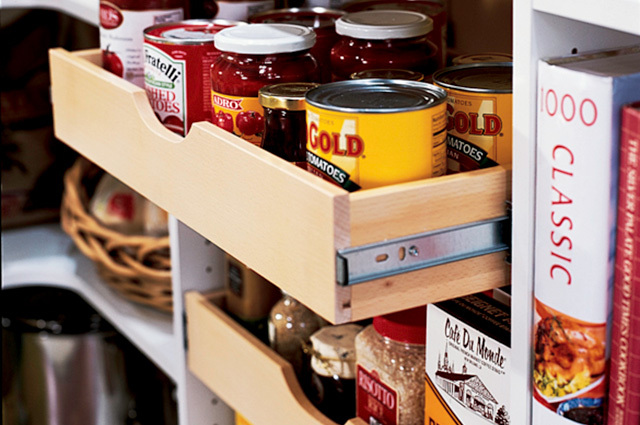 The adjustable shelves allow you to alter your cabinets to fit your current needs. 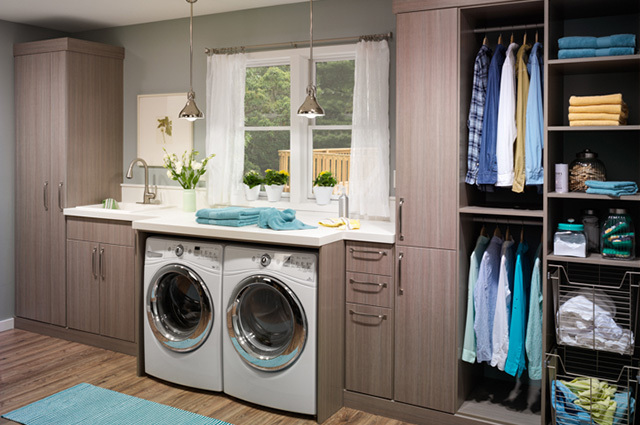 Tall cabinets are an excellent place for hanging athletic and outdoor clothes. This garage is shown in the "Copper Blaze" color. One size should not fit all for your garage cabinetry. With the Innovate line through OrgHome you can get 24" deep cabinets for your golf clubs, coolers and totes. The 18" cabinets work well for rakes, shovels and boots. The 14" cabinets are best for your smaller tools. Cabinets are shown in the "Driftwood" color with white interiors. What good are nice looking cabinets if the drawers are a disaster inside? These storage compartments can keep your tape measures, safety glasses and small parts organized. Full extension drawer glides will allow you to see what's in the back. Shown with a white interior and a "Copper Blaze" exterior laminate. Ergonomically it's a lot of easier to pull out a drawer than to have to bend over and reach in. These pull out baskets simplify getting your favorite sporting equipment, bags or storage items. This shelving is shown in the "Chateau" laminate pattern with a white interior. 1" thick adjustable shelving can change with your needs. There is no need to worry about your rakes and shovels falling off and hitting someone on the head. Using the OrgWall accessory system your rakes, shoves, hoes can be stored neatly and safely away. The extra tall cabinetry is shown in 18" and 24" depths. Thicker edge banding is available for increased for more rugged requirements. Shelving and cabinets are shown here with a "Platinum" exterior and white interior laminate colors. The size and placement of your garage cabinets will vary on whether you have an expansive garage in Westerville or a small one in Upper Arlington. Your Innovate cabinet system is custom designed to fit your space – and built with your window opening and outlets in mind. The "Heritage Maple" Cabinets in this design included a work bench with shorter cabinets and some mid-sized units around the window opening and larger wall hung units where space allowed. Garages can be more than just messy places for your tools. This garage organizer system has a workbench and entertainment areas as well as a mix of different sized cabinets. The "Driftwood" series has a clean, polished and contemporary look. The butcher block series countertops are durable for your hobbies or projects. The OrgWall system provides a place for convenient tool storage close to the work bench. The "Driftwood" series has is sleek and contemporary. Cabinets are various depths make the workbench space practical and safe. Get the most out of your space and schedule a free design consultation today! A place you can call your own – Finding the perfect place for your hobbies, golf clubs and sporting equipment and tools can be challenging to find a place inside the home. Adding new, sturdy custom garage cabinets, storage units and a workbench can give you the space and organization you’ve always wanted. Reduce stress and simplify life – Is there anything worse than the frustration of trying to find the right tool for yard work, or your fishing vest you know you put away (somewhere) to go up to Hoover Reservoir or your favorite football to play with the kids. With a wide variety of tall, short and deep custom garage cabinets and pull out drawers everything will finally have its place. A sleek, stylish garage you’ve dreamed of – After a long day at work it’s nice driving into a sleek, contemporary garage which is actually organized. With 7 high end finishes and modern extruded aluminum handles your friends will probably be a bit envious of you though. Specifically designed with your needs in mind – Let an Innovate Home Org design consultant complete an inventory of your storage, sports and entertainment needs and interest and design a custom garage cabinet system for your Columbus home which will not only meet your needs today – but can be adjustable to your needs as your family grows. A durable low maintenance system – You work hard and deserve to have a garage storage units and shelving for your Columbus home which will stand the test of time. With 1″ thick shelves, butcher block workshop tops and 2″ thick “Forterra” seat tops you’ll know you made a selection which will endure. Since the custom garage cabinets are wall mounted (and installed off the bottom of the garage floor) you won’t have to worry about the negative impacts of a damp floor. Innovate Home Org, a reputable professional here to serve you – As part of Innovate Building Solutions (our parent company) we have served over 180,000 customers since 1977. Over this time we have learned to listen to you and offer suggestions to help you find the best solutions for your project. 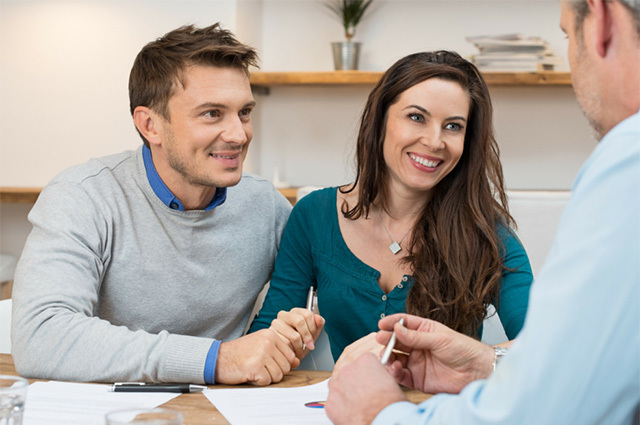 Since we are not burdened by franchise fees our pricing will provide a good value – without the need for sales and marketing gimmicks. A complete garage plan with the products to make it possible – Just like you need to choose the right tool to do a specific job – you need the right garage products (in the right location) to have a garage which will work (and be enjoyable for you). Let an Innovate work with you to identify the various “zones” in your garage and offer cabinetry, hooks, racks baskets …..and even entertainment features ….to have a garage which works for you. 7 contemporary color and hardware combinations – Why not have a garage in your Powell or New Albany custom home which compliments your luxury sports car or boat? With 7 high end color choices (ranging from Copper Blaze, Heritage Maple, Stone Grey, White, Platinum, Driftwood and Chateau) your custom garage cabinet and storage no longer needs to take a backseat to your cool looking car or SUV. Cabinetry options for all your storage needs – Our 1″ thick cabinet shelving system with full back panels is not housed in a “one size fits all” cabinet. For your large totes there are 24” deep cabinets. For your golf clubs choose the extra tall cabinets. For the cabinetry above your workbench the 12″ units will make the most sense. What’s nice about these selections is all the shelving is adjustable giving you flexibility to easily to move them around as your needs evolve. Superior strength and a rugged design – The custom garage cabinetry from Innovate Home Org will not wear like the cheap stuff you might find at your local home center store. The edges of the cabinets are protected by an industry leading thickness edgeband, the shelves are 1″ thick and the Foreterra seat tops are 2″ thick. The drawers use a well constructed dovetail design with full extension glides so you can even find things in the back. 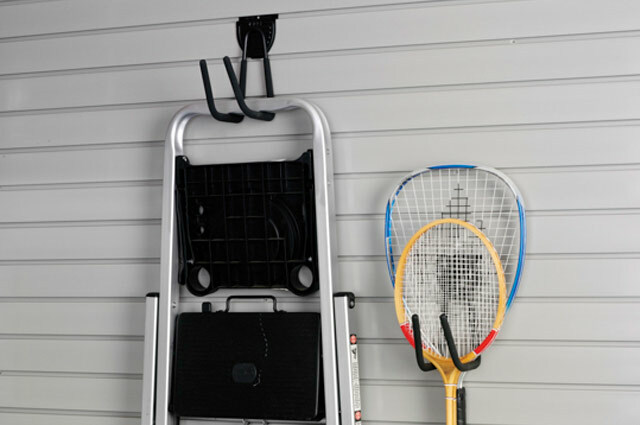 Accessories to keep things in their place – You will not lack options in finding the accessories for your tools, sports equipment, clothes and shoes and even your desire for entertainment. Some of the custom garage cabinet accessories include baskets, hooks and bins, boot benches and shoe shelves, rack, slat walls, recycling centers and even a secret “display shelf” for your favorite adult beverage! 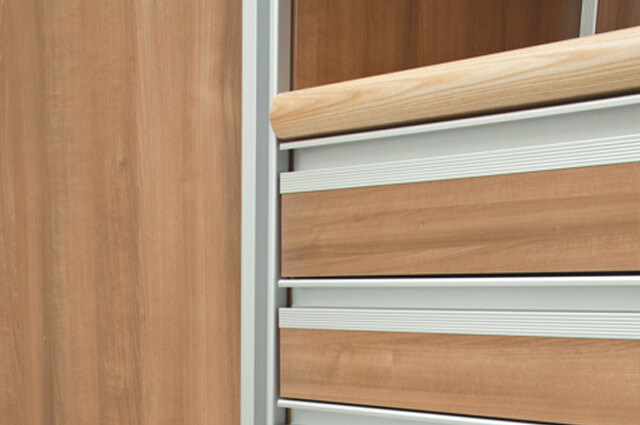 Advanced product manufacturing for improved quality and better lead times – Our manufacturing partner (the Stow Company) makes our door and drawer fronts in one integrated plant (not sourced to a 3rd party). This provides you with a coordinated finished product with higher quality and shorter lead times. Their state of the art 1,000,000 square foot facility in Holland, Michigan uses the latest technology in laser and computer numerical control equipment to ensure a well built product for you. Adding contemporary color, a textured finish, or choosing durable garage door and drawer selection can help have a garage you're actually proud to drive into (instead of a dirty mess). Explore the wide array of options below or with your Innovate Home Org Garage Representative.